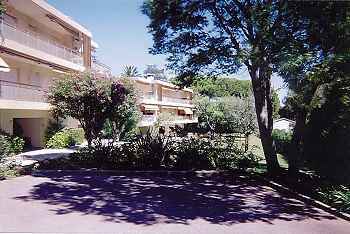 Our apartment near the Salis Plage in Antibes is not available: Please scroll down to the bottom of this file for other villas and apartments to rent. A two bedroom luxury apartment situated in a superbly kept residence in the heart of the sophisticated area of the Cap. The grounds are perfectly maintained and floodlit and the property is protected by a security gate with plenty of safe parking space. The apartment is on the first floor of this quiet block with stunning views of the famous Cap lighthouse and church. Large balcony with dining table and chairs for eight and a built-in barbecue. The living area has modern sofas and easy chairs, together with satellite television (Sky), VCR and radio/CD player. The kitchen is complete with fridge, freezer, microwave ,oven, washing machine, tumble dryer and well stocked with fashionable cutlery and crockery. The bedrooms have 2 ful size twin beds, face cool north, with ceiling fans and plenty of fitted cupboard space. A private garage is provided and there are 2 new bicycles available for use. Towels and beach equipment are also available -just bring your suitcase! The beach of La Salis is an easy walk down Avenue de la Salis and it is a pleasant walk into Antibes. There is also a free bus that runs from the beach into Vieil Antibes every 20 minutes. There is a tabac along Boulevard du Cap for your morning bread and a well-stocked Casino supermarket or Intermarché for a larger selection of food and wine. A telephone line is available for incoming calls. (For outgoing calls, by special arrangement). Please note, the flat is not really suitable for children under the age of 5. There are numerous restaurants in Antibes/Juan-les-Pins and the surrounding area. Cards from recommended restaurants can be found in the flat. Please add to these if you find any ‘treasure’! The Côte d’Azur is a fascinating and diverse region with numerous beaches, beautiful mountain villages and sophisticated shopping. Lots of information is available on this area either from the French tourist office or the internet. If you have specific enquiries, please ask. There is also a book in the flat with detailed information and maps on the area. provides tourist travel lettings and property information in Antibes and the French Riviera. Villefranche Old town rental appartments with sea views. Two one bedroom apartments beautifully renovated and decorated with original art, great lighting. Each apartment has an office or desk area with wireless broadband if you need to catch-up with some work, do some writing or find out about local events on the Internet. Apt 1 Sur le Toit: 2019 . . . : Good availability.. Apt 2 Artist's Atelier: 2019 . . . : Good availability.. Apt 1 ­ Sur le Toit. . Apt 2 ­ Artist’s Atelier. .
Nice: 1st floor apartment near the old city and the port of Nice (sleeps 4) The southern exposure allows for a pleasant stay. You will find everything you need at the “centre commercial Nice TNL” that is just down the street. The train station is just a 5 minutes walk away from the apartment. 2019: Good availability - please enquire. Villefranche sur Mer apartment to rent near Nice Old town apartment recently renovated very beautifully in small town full of character with sea views. 1 bedroom Apt 1 Sur le Toit: 2019 . . . : Good availability.. Apt 2 Artist's Atelier: 2019 . . . : Good availability.. Apt 1 ­ Sur le Toit. . Apt 2 ­ Artist’s Atelier. .
- where the webmaster would like to be! For a pictorial guide to the best holiday vacations on the net that are likely to become your favourite places too, with destinations from America to Greece. Greece: Greek Villa in an exclusive area for rental or for Sale in mainland Greece can sleep up to 10 with own pool and panoramic views and 30 meters from the sea. Currently long-term unavailable. Northern Cyprus - Kyrenia: 3 bedroom old villa wonderful for getting away from it all (whilst still being able to remain in touch if you want to! French Alps - Summer/Autumn: Traditional style chalet offers B&B or half board holidays in the green mountains before the snow and skiers arrive. Enjoy exhilarating sports or simply enjoy the picturesque villages, towns, lakes and mountains. Currently long-term unavailable.